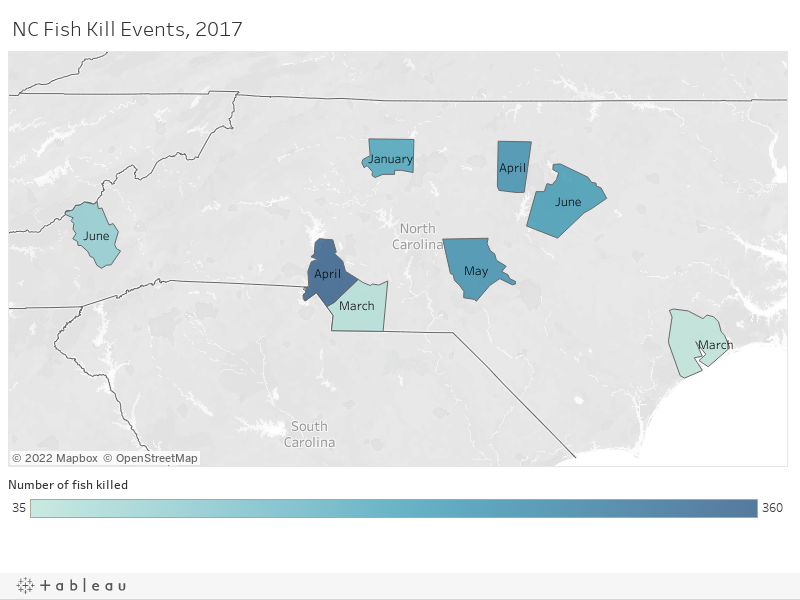 H erbicides, fabric dye and wet concrete discharging into North Carolina lakes and creeks have killed 1,470 fish so far this year, the lowest number since at least 2012. But the season is still early. Most fish deaths, particularly in coastal estuaries and inland sounds, occur later in the season, when water temperatures rise, oxygen levels fall and algae blooms proliferate. Estuaries in the Neuse River and Pamlico-Tar river basins Down East usually have the greatest number of kills. This year, though, human beings, not microscopic organisms or weather, are responsible for most of the killing, according to state environmental records. In January, an illegal discharge of red dye from a Hanes textile finishing plant killed 200 fish along one mile of Peters Creek near Winston-Salem. Another 50 died in March in Union County because of a sewage spill. A farmer illegally poured wet concrete into Bald Creek near the mountain town of Waynesville and killed at least 100. And in two lakes and one private pond, including in the tony enclave of Ballantyne near Charlotte, herbicides and algaecides, used apparently to kill plants in the water, inadvertently killed 610 fish. In 2016 through July 4, more than 10,000 fish had died; by this time of the year in 2015, the number was 19,400, although the majority of the fish killed occurred when the Coats American factory discharged caustic chemicals into a tributary of the North Catawba River. Plant staff didn’t know the floor drains discharged to a storm sewer and the tributary, not to a wastewater treatment plant.